I'm currently doing a post on re-dying a Proenza Schouler PS1 bag, so in the interim, I thought I'd post my new designer score. I have a knack for snagging $3,000 bags for $300 (Canadian prices, obviously). I don't mind a bit of wear on a purse. I use things hard, so 5 years with someone who cares for their handbags is equivalent to 5 months with me anyways. 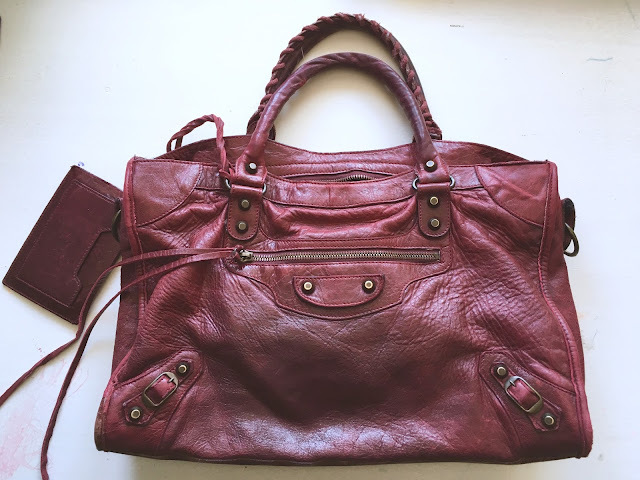 Yesterday was my birthday and about a week ago I came across this Balenciaga City bag in Bordeaux with a very low starting big. It was around 11:30pm, there was about 14 minutes left on the auction, and without even looking into it, I bid and won. Talk about an impulse purchase. Around midnight, I started to worry that the bag was a fake. So I spent the better portion of 2 hours investigating its authenticity and I came to the conclusion that it was indeed authentic. The seller was a trusted source. Phew. And when it arrived, I was even more certain about its authenticity. It was clearly listed at such a cheap price because of its less than stellar condition. Fine by me! It has a great patina. And so I anointed this bag as a birthday present to myself! And I love it. The size suits me more and I love the oxblood color. I originally wanted the City with giant studs in black but that will have to wait.